A treasure trove of marine delights hides in plain sight along our coastline. Rock pools are tiny but complex ecosystems, where only the hardiest of inhabitants survive the onslaught that nature throws at them. Pounded by waves, whipped by the wind and exposed to the sun, the creatures who lie within have learnt to adapt to their constantly changing world. At high tide they are connected to the greater ocean environment, but when the water level drops, they are isolated, and vulnerable to predators and the elements. Water temperatures can vary by as much as 20 degrees in the shallowest of pools from the intensity of the midday sun at low tide, to the flushing of cooling currents when the shoreline floods again. Making the most of available shelter is the key to survival in the inter tidal zone. Sea urchins wedge themselves into cramped crevices, sea stars and sea cucumbers cling to the underside of rocks, making them often invisible at a casual glance. Spotting the life inside these pools takes patience and care. Small fish will dart to the edges when noise, vibrations or shadows alert them to potential predators but stay quiet and still for long enough and they pop back out. A carefully concealed creature can give away its hidey-hole by one misplaced limb that can take minutes of constant gazing to spy. And while it may be tempting to delve a little deeper into the darker patches, beware the dangers that lurk within. Blue ringed octopus are only little but their venom packs a punch – one bite from these highly venomous cephalopods can kill a human in minutes. A hands off approach with rock pools is the safest option. 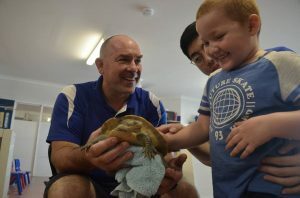 But if visiting the coast is not a practical option, Ocean Life Education can bring the rock pool to you in a safe yet interactive incursion designed to showcase the animals that live around our beaches. 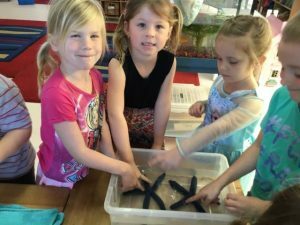 Sea stars, sea cucumbers and sea urchins can all be carefully handled during our visits to schools, early learning centres and special events, as we explain the important role our oceans play in keeping our planet healthy. We offer a wide range of programs that align with the Australian curriculum and cover topics such as adaptations, habitats and human impact. 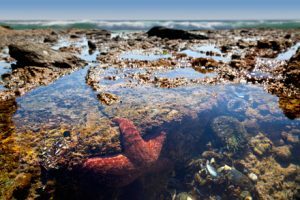 Let Ocean Life Education inspire your students to become interested in coastal environments and as they look, listen and touch their way to a greater understanding of the marine world, they will start to see why rock pools rock. This entry was posted in Uncategorized on March 10, 2019 by oceanlifeeducation.